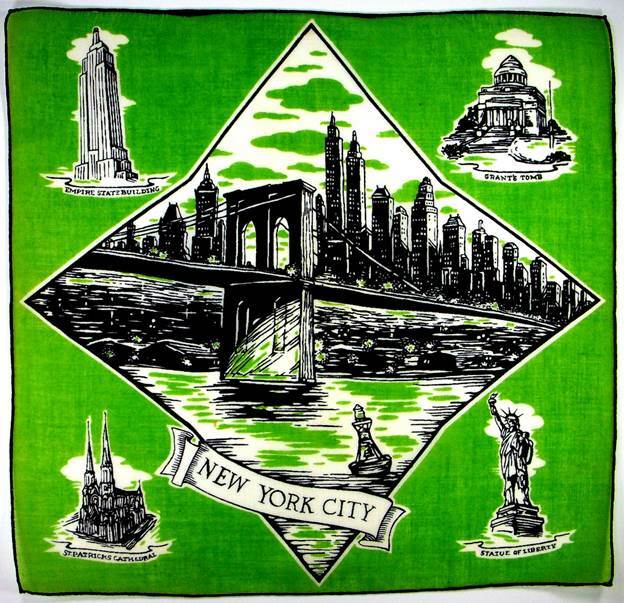 From the Statue of Liberty to the Brooklyn Bridge, the Flatiron Building to the Staten Island Ferry, Times Square to Grand Central Station, The Empire State Building to Rockefeller Center…my, oh my… Washington Park to Central Park, St. Patrick’s Cathedral to the Ground Zero Memorial, from outdoor movies to outdoor murals, to ice skating in Central Park… if you can’t find it in New York… it probably doesn’t exist. Where else can you find a Christmas tree 100 feet tall topped by a Swarovski crystal star 9.5 feet tall? Or cool off on a hot summer day with wasabi ice cream or olive oil gelato? Order from 20 different varieties of bottled water on the menu? (The Rainbow Room, Rockefeller Center) What other city has to narrow the list of movies about their metropolis to the “Top 100”? Yikes! 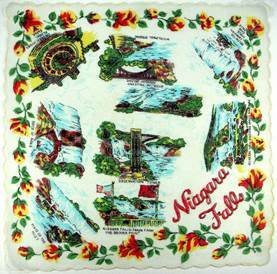 Natural wonder Niagra Falls was a perennial favorite for honeymooners, and souvenir hankies and hand painted handkerchief boxes abound. 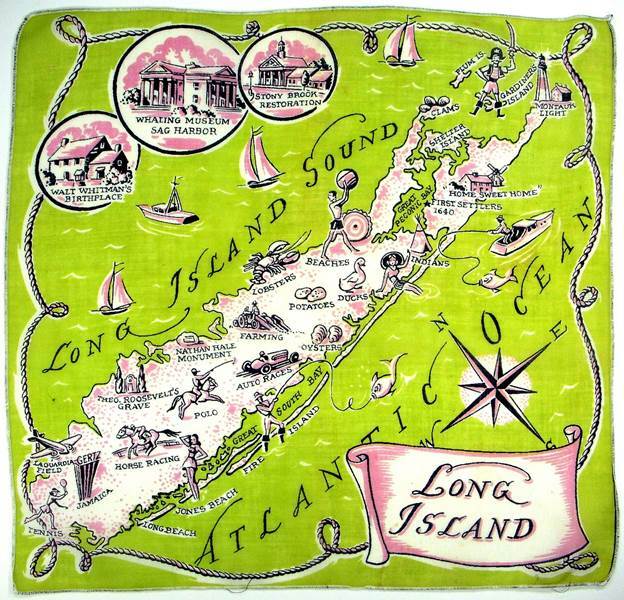 Charming villages scattered along the shores of Long Island offered a summer respite from the cacophony of the city, proffering strolls through the Whalers Museum, the Customs House, quaint antique shops and hushed churches. 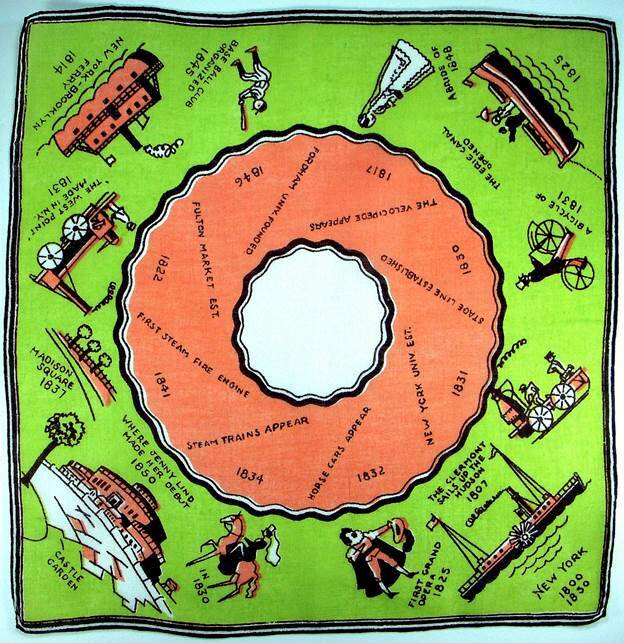 True, there was always polo playing, auto racing, and dinner at the yacht club, as the graphics on these hankies confirm, but today it appears that summering on Long Island is, at least for some, more about being seen, than taking time to retreat, refresh and restore. Coming into the city offers spectacular skylines from multiple perspectives. 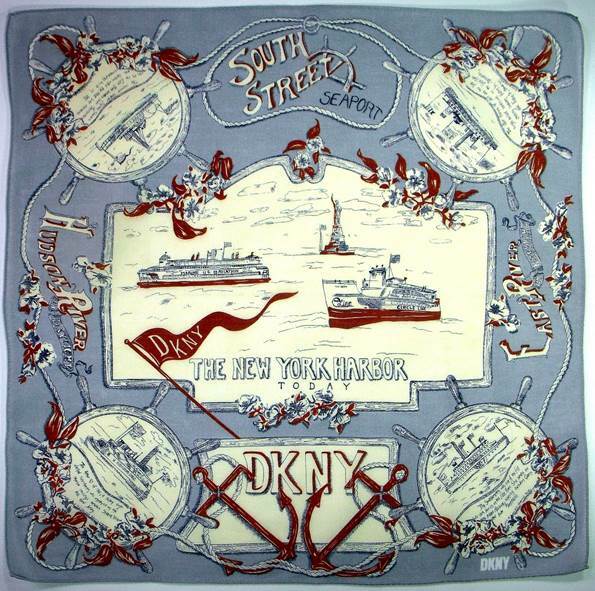 Even Donna Karan pays tribute to the New York Harbor with mini-histories of important nautical vessels anchoring (pun intended) each corner. 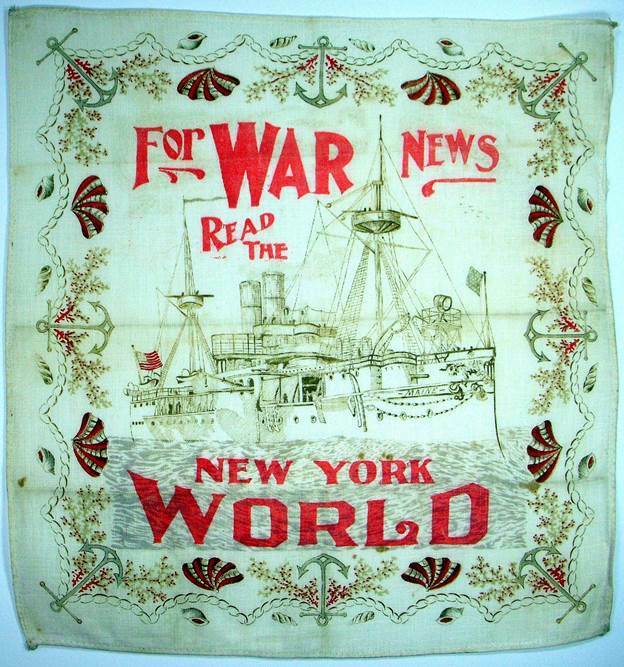 Several handkerchiefs focus on landmark events in New York history. 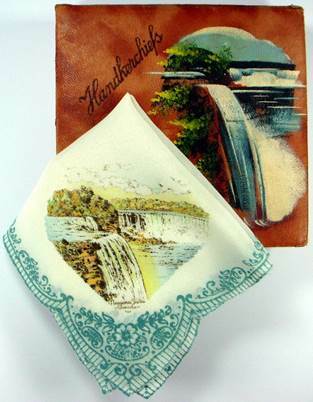 These “Then and Now” hankies are charming. 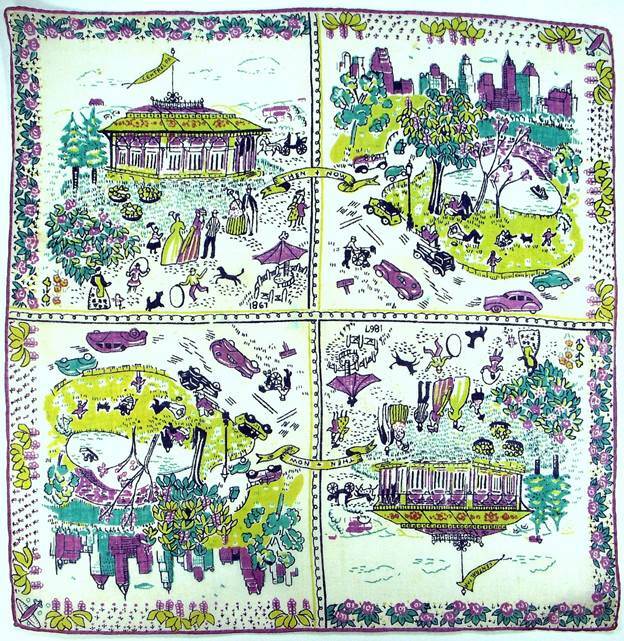 Note the style of the cars in the “Now”section of Central Park, which helps date the handkerchief. Another “Then and Now” features the Old Resevoir, and the New York Public Library. Look closely and you’ll see the famous marble statues of the lions Fortitude and Patience guardingthe entrace to the Library. First named Leo Astor and Leo Lenox after the library founders John Jacob Astor and James Lenox, they were renamed Patience and Fortitude by Mayor Fiorello LaGuardia during the Great Depression of the 1930’s, as he believed these were the attributes New Yorkers would need to survive the economic crisis, and they’ve been called that ever since. 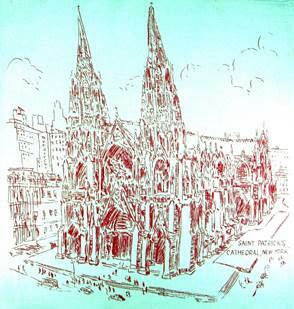 When Trinity Church was built, the Anglicans had to first request a land grant from the Governor. Eventually, in 1705 Queen Anne granted a permanent grant of 215 acres. Trinity has several satellite chapels, including it’s first one, St. Paul’s, which is celebrating its 250th anniversary in 2016. (Following his inauguration, George Washington prayed in St. Paul’s Chapel.) 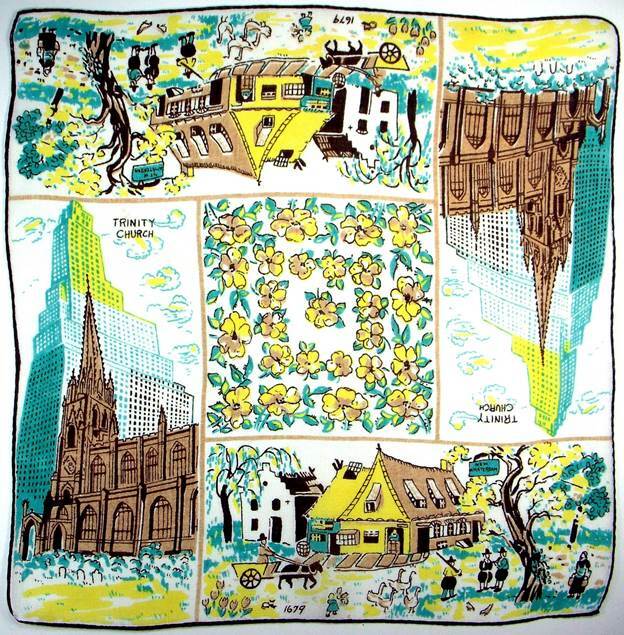 Today known as Trinity Church Wall Street, the church and its chapels have an incredibly rich history which you can read about on the web. 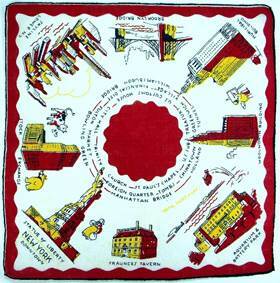 I’ll try to refrain from digressing into too many stories, but each of these handkerchiefs is rich with history. When we discarded these fashion artifacts, we also dispensed with the stories, traditions and memories which accompanied these keepsakes. 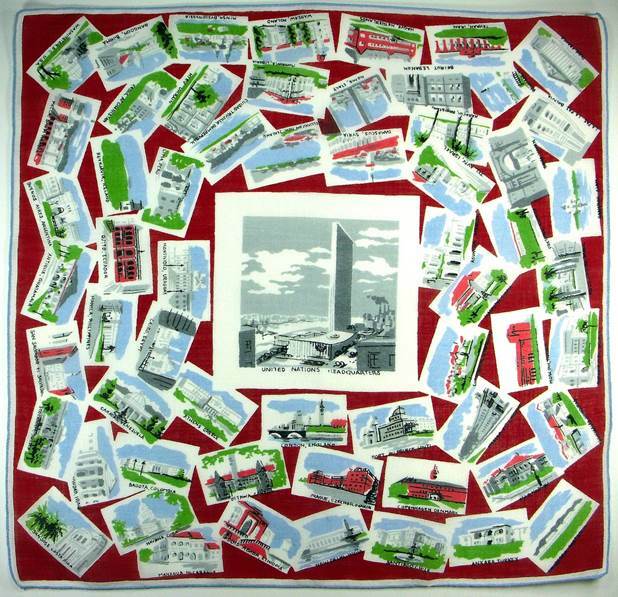 The next few hankies are historical compilations of famous landmarks, events, and award winning architecture. 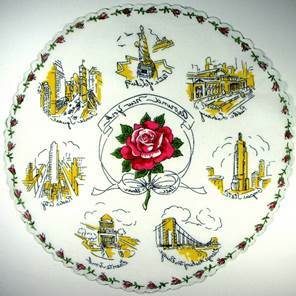 The round hankie was a favorite souvenir with many. 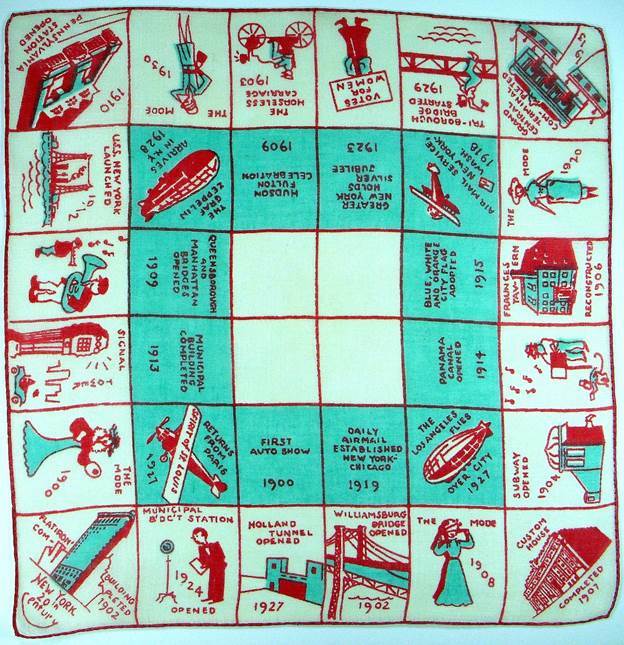 I’m particularly drawn to the quiet elegrance of the shadow hankie on the right. A classic. 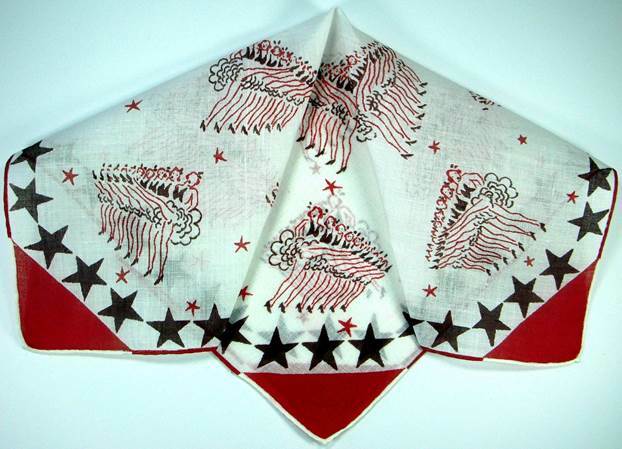 The pinwheel layout allowed a lady to flutter and flounce all four corners of her flirty pocket square. 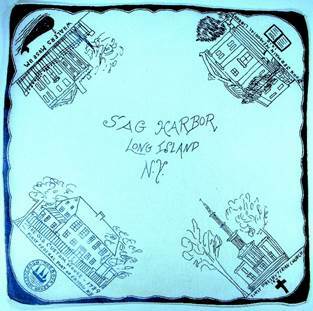 Note the prominent position of Fraunces Tavern, featured centrally on the left, and anchoring the bottom border on the right. It served as headquarters for George Washington and was a venue for peace negotiations with the British. 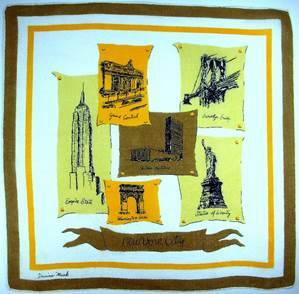 It claims to be Manhattan’s oldest building and is part of the New York Freedom Trail. 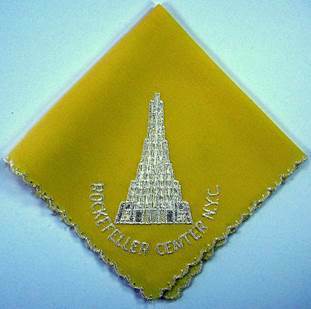 This hankie cracks me up. 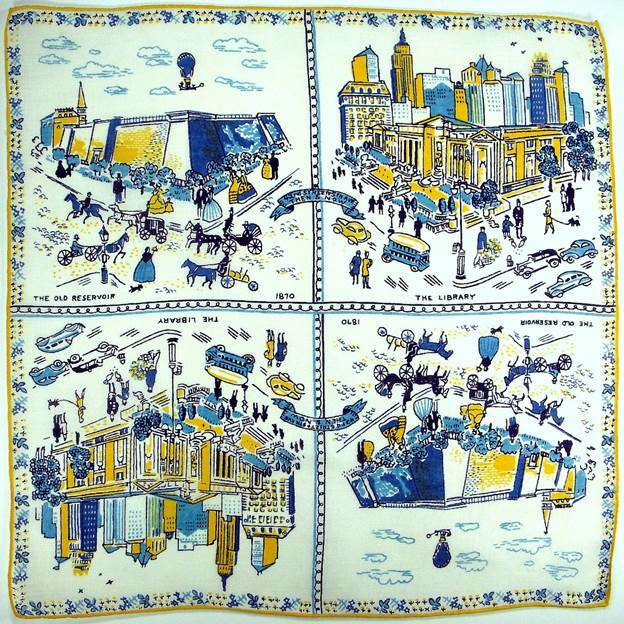 It features Times Square, Penn Station, etc. 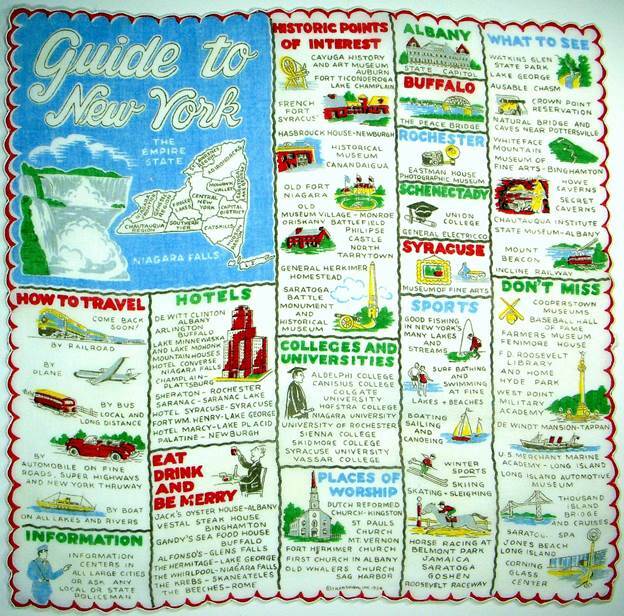 but then it appears as though the artist ran out of steam, and just started listing things – busses, taxis, hotels, dining, etc. It’s fun and fanciful, but slightly silly. 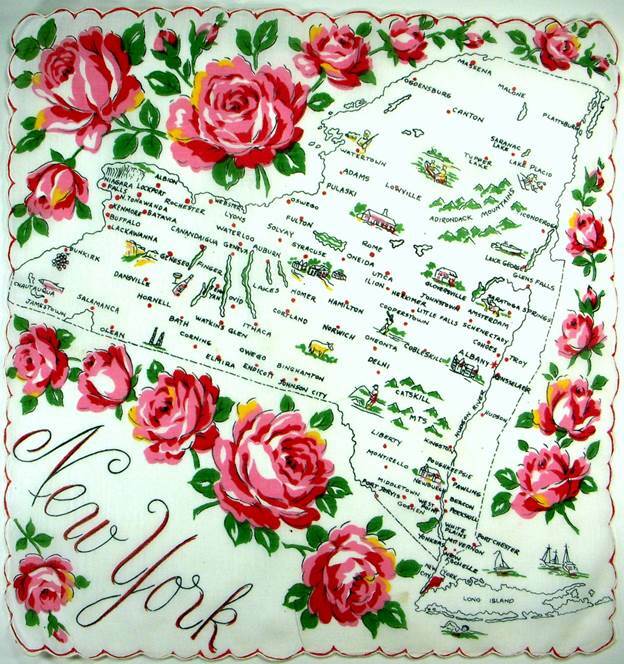 This cranberry beauty pays tribute to the architecture and landmarks of New York with a celebratory ribbon border. Lovely. Handsome and hip, this bulletin board/pin-up layout on the left seems like it came directly from a Madison Avenue brainstorming session on the wonders of New York. 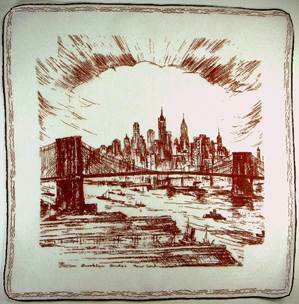 On the right, another artist’s tribute to the skyline. 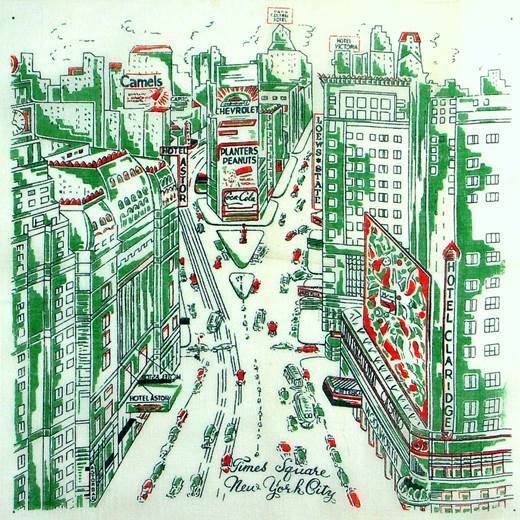 This delightful charcoal and persimmon bird’s eye rendering captures New York’s hustle & bustle while managing to maintain a sleek and sophisticated sheen to the environs. This is the city everyone wants to experience. 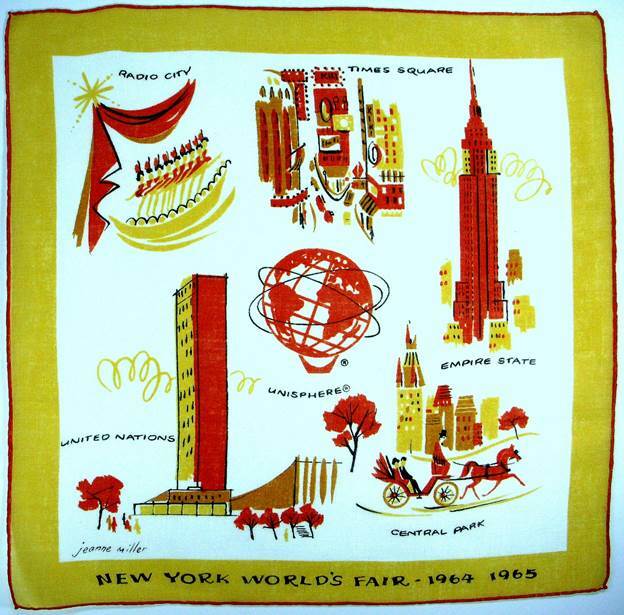 Chic, contemporary, and current, this 1964 World’s Fair souvenir is as polished and professional as the era it reflects. Interestingly, it’s up-to-the-minute for the time it portrays, whereas the 1939 World’s Fair dreamt of decades far into the future. 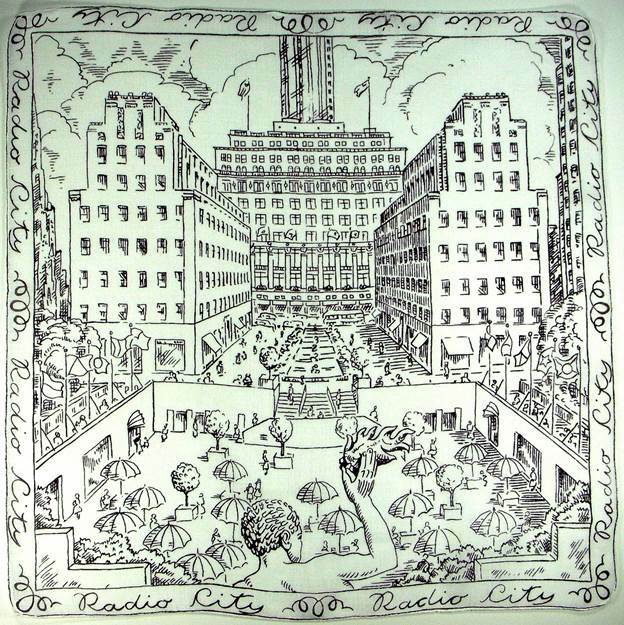 Note the fun, energetic graphics used to depict the Rockettes in the hankie above. 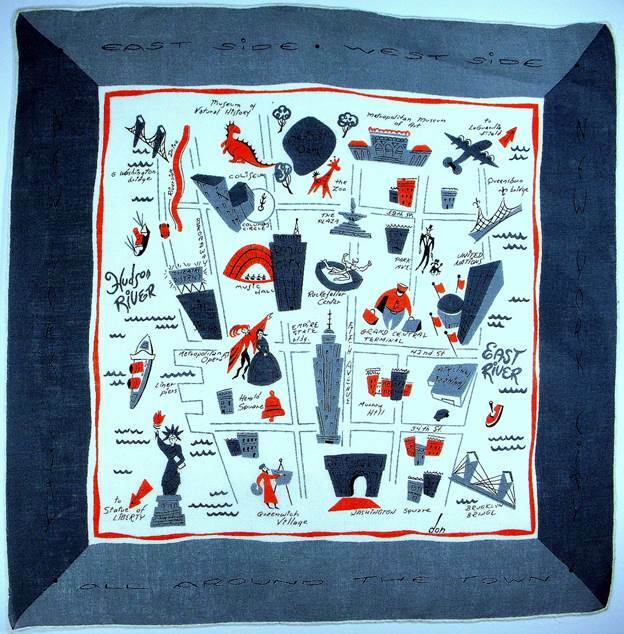 By contrast, the Rockettes in the hankie below appear to be from the 1940s. This precision dance company has been a staple at Radio City Music Hall since 1932. Another bird’s eye view hankie, this time depicting the Prometheus sculpture in the Center’s lower plaza, which is used for dining in summer, and ice skating in winter. 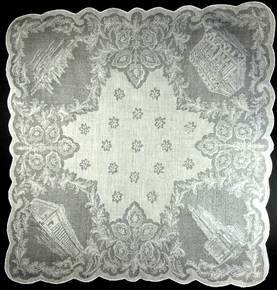 Again, the style of the cars in the border is a tip-off as the the age of the handkerchief. 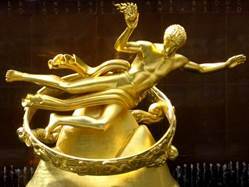 Historians claim the most photographed sculpture in NYC is Prometheus in the lower plaza of the Center. Prometheus was a Titan who stole fire from Mt. Olympus, gave it to mankind, (note the flame in his right hand), and taught him how to use it, (metalwork). He is thus associated with science and culture. 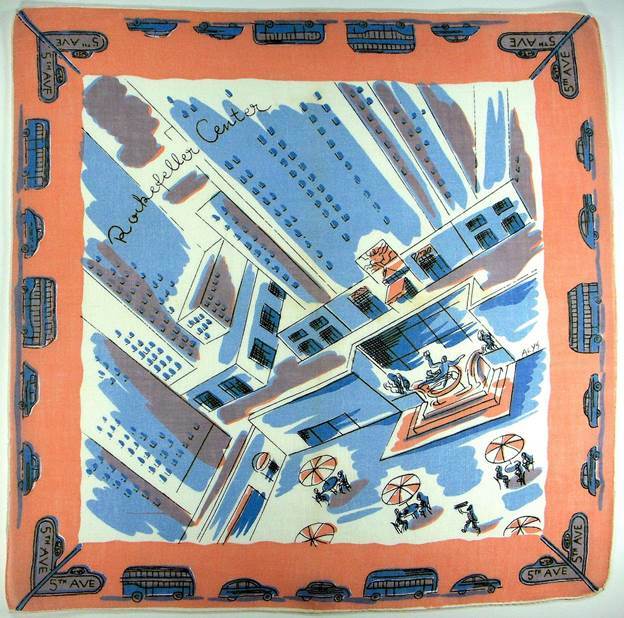 This hankie shows the plaza viewed from behind the famous statue. 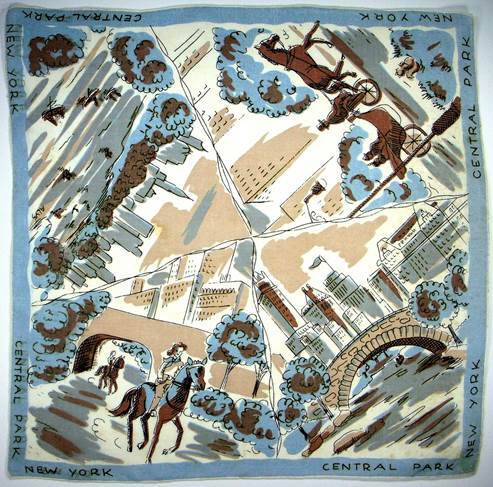 Originally called Long Acre Square, this location served as the site for William H. Vanderbilt’s American Horse Exchange. 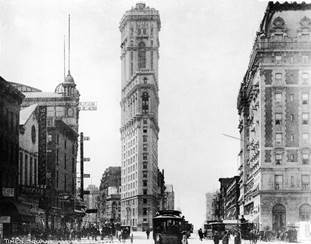 Once the rapid transit (IRT) was installed, 42nd St. became a transportation hub, and real estate speculators descended on the area, including Adolph Ochs, owner of the New York Times who built Times Tower there. 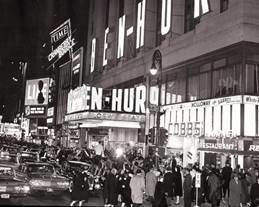 Ochs also staged the first New Year’s Eve celebration there, which continues today. 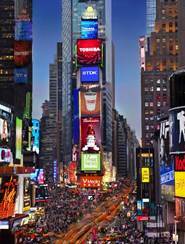 By WWI, most theatres had moved to Times Square, along with restaurants and hotels like the Astor and the Knickerbocker. 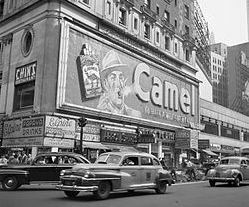 This 1948 photo shows the Camel cigarette billboard (which actually “smoked”) mounted on the Hotel Claridge. The crowd on the right is entering Lowes Theater. 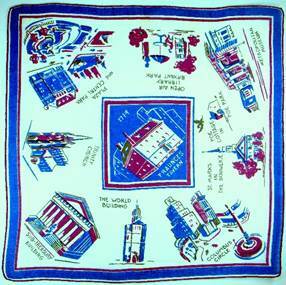 Both buildings can be found in the handkerchief above. 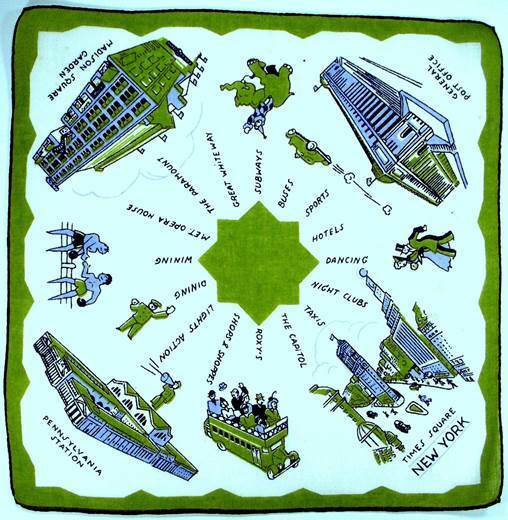 This “Remember the Maine” hankie is an example of just such journalism, attempting to whip people into a frenzy. 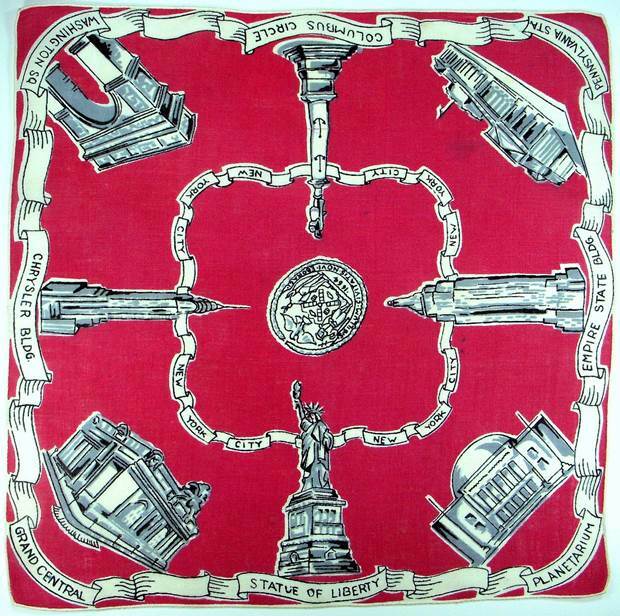 I find it Interesting they had handkerchiefs printed with this image. I wonder if it was a souvenir from a rally. Certainly Pulitzer was adept at rallying the troops, as we discovered in the heartwarming story of how he was instrumental in raising the Statue of Liberty . It’s impossible to describe the magic that is New York. You may glimpse and inkling of the diversity of the city and her people from the movies listed below. 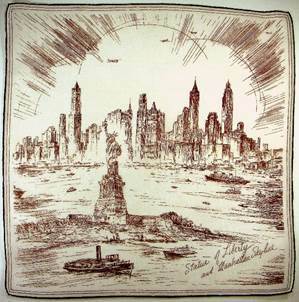 Additional New York handkerchiefs can be viewed at 1939 New York World’s Fair and An Artist’s Impression of New York. From Wall Street to Mean Streets, The Godfather to Goodfellas, Midnight Cowboy to Miracle on 34th Street, Brighton Beach Memoirs to Bright Lights Big City, New York provides the quintessential backdrop to showcase the Story of Man. In 2015, Vanity Fair magazine chose the top 10 greatest movies about Manhattan, culled from their top 100. Indeed, what better way to portray this town than through her stories, captured in celluloid. Whether Breakfast at Tiffany’s ingénue or Taxi Driver tough guy, New York has a borough, a tribe, a society to suit your style. 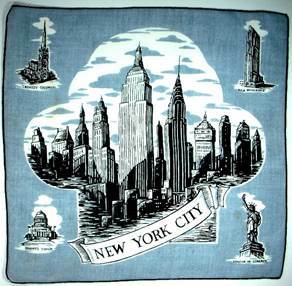 Being a “Native New Yorker” I really enjoyed this Blog – but then, I enjoy all your Blogs – thank you for sharing !! !